Choosing tile for your floors is an easy and affordable way to increase the attractiveness and value of your home. No matter what color, style, and material of tile flooring you select, or whether your tile is more suitable for a kitchen or bathroom, flooring installation can make a drastic impact on the appearance of your entire room. Any floor options for one room or an entire house last longer with the correct installation method. When you are ready to choose flooring, it is important to consider the application method involved in laying tile. The way your flooring is installed affects the longevity of your tile. That is why you want to work with a company that understands how to install your flooring correctly. The first thing your contractor does is evaluate your substrate to ensure that they are level, clean, and dry. If you want a balanced look, it is necessary to snap a grid of chalk lines. This gives your room a more finished look. Finally, you and your contractor should choose an adhesive that is formulated to work with your substrate. 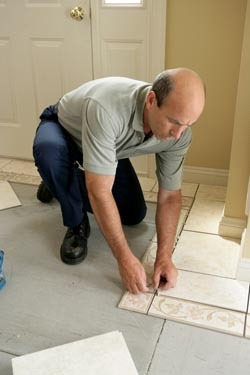 In general, installation of tile follows a similar pattern to other floor options. However, there are a few differences depending on whether you have chosen porcelain, non-porcelain, or natural stone tile. For example, it is a good idea to install an underlayment that is designed for use on natural stone. Ceramic and porcelain tile are installed in a similar fashion, though some feel that porcelain is a little more challenging to work with. However, porcelain has a lower water absorption rate, making it a great choice for bathrooms. It is also denser than ceramic tile, so it is better suited for use in heavier traffic areas. Ceramic is less dense than porcelain, so it is easier to cut during the installation process. That means it is a little easier to install. Another benefit to choosing a ceramic tile is that it is almost always less expensive than porcelain tiles. Choose tile for flooring that is both family friendly and easy to maintain. Once of the factors to consider is the product's PEI or Porcelain Enamel Institute rating. This rating is a quick and easy way for you to determine the durability of tile products. Contact us for all your flooring needs. Ask about our 12-18 month financing option. We serve customers in Santa Barbara, Isla Vista, Mission Canyon, Montecito, Summerland, Toro Canyon, Goleta, Carpinteria, Santa Ynez, Solvang, Buellton, Meiners Oaks, Mira Monte, Oak View, Ojai and Ventura, California.